This is the aforementioned six-hour cake. It might take less time if I were truly and reliably competent at either Genoise sponge, meringue, or lemon curd (and actually, these days, I have it down to about five hours, assuming nothing goes hideously wrong), but I’m not, and in fact I’m yet to get all three of the main components of this cake right on the same occasion (the lemon syrup, I am glad to say, I generally manage just fine). On the bright side, my success rate on all three of these things is much increased now that I have an oven that may possibly be telling me the truth about temperatures. This recipe is slightly adapted from the one in the Australian Family Circle cookbook, Making Beautiful Cakes. I haven’t been game to play around with the sponge recipe, though I’ve added notes to it below, because I find that there are tricks to it. I have, however, used a different method (and more zest) for the lemon curd, and I make more meringue. 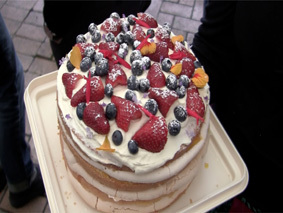 Also, my version is topped with berries and flowers because I think the last thing this cake needs is more meringues on top. But you may disagree. Frankly, I think this is the most delicious cake ever – entirely worth spending six hours on once or twice a year. And it looks spectacular. edible flowers from your garden: nasturtium petals, lavender flowers, rose petals, violets, rosemary flowers, pineapple sage flowers, or other herb flowers are good; feel free to have a mint leaf or two, if you like. OK, you are making four different components here (five if you count the whipped cream and the berries and flowers): cake, syrup, meringues, and curd, so a little planning is helpful, especially if you are doing this after work. You will want the cake to sit, assembled, in the fridge overnight before serving, but you really shouldn’t make the sponge earlier than the night before. The curd and syrup can both be made a couple of days ahead of time and stored in the fridge; the meringues can also be made a day or two ahead, provided you have a large enough airtight container to store them in. If you’re making it all on the same day, I’d start by making the cakes, which take the longest to cool, have the meringues ready to bake when the cakes come out of the oven, and make the curd and syrup while the cake is cooling. The meringues always take longer than you think to dry out (but cool down in minutes), so making them after the cake will save you a lot of frustration, as the cake batter is not forgiving about being forced to wait before going into the oven. Add the cream and berries at the last possible minute before serving (an hour or two in advance is probably fine, though). Pre-heat the oven to 180°C, and brush 2 deep 22cm round cake tins (springform are excellent) with melted butter. Line the bases with baking paper, and brush this with more melted butter. Sprinkle the whole lot with a little flour, and bang around a bit until you have a very fine coating of flour over the whole surface – tip the rest out. Yes, this is a pain, but you really want the cake to come out of the tin cleanly. Sift the flour three times. Theoretically, you do this onto baking paper, but I find that this method is a great way to get flour all over the kitchen. So I sift three times between bowls, and sift again when folding it into the mixture later on. I’ve never quite worked out how this aerates the flour, but I am not a sponge expert, so I just shut up and do what I’m told. Melt the butter, and let it cool a little while you do everything else. Get a saucepan half-full of hot water onto the stove, and bring to a simmer. Place a very large (heatproof) bowl on top of the saucepan – the base of the bowl should not touch the water, add the eggs and the sugar, and start beating. You need to beat the eggs and sugar for quite a long time, until the mixture is fluffy, increased in volume, and thick to the point that when you raise the beaters and do a figure 8 trailing batter back into the bowl, it doesn’t sink immediately. This part is interminable. The recipe says 8 minutes but I usually find it takes ten minutes or longer. And yes, I’m using electric beaters – even I draw the line at using a fork to make this recipe. Incidentally, this may be superstition, but I find the batter works best when I use a big glass bowl rather than a metal one, and I trust you know better than to use a plastic one. When your eggs are ready, gently pour in the melted butter and sift in the flour. Fold everything together as quickly as possible with a spatula (turning the bowl helps with this, but I’m afraid I can’t really describe folding very well, because I’m not entirely sure I do it right myself). You want the mixture to be just combined – don’t knock all the air out of it. Divide the mixture between your two tins, and get it into the oven as fast as possible. The cakes need to bake for 25-30 minutes – I can’t fit them side-by-side in my oven, so I usually swap them around at about the 20 minute mark. Don’t swap them before 15 minutes, and swap them fast, or they will sink on you. Cool them for five minutes in the tin, and turn out onto a rack to cool completely. Meanwhile, get on with the.. Turn down the oven to 120°C and separate your five remaining eggs, setting the yolks aside for the curd. Get out three baking trays, cover with baking paper, and trace a 21cm circle on each. Actually, I usually trace around the base of the tins I’m going to cook the cakes in, so my meringues are bigger – which is fine, because this mixture makes a bit too much meringue anyway. Beat the egg whites in another big glass bowl (metal will do, too), until they form soft peaks. I’ve never known what this is, but I take it to mean that the peaks stand up, and the whole mess doesn’t move around too much when you tip the bowl to one side. Incidentally, you know, I am sure, that the bowl needs to be very clean and non-greasy, as any speck of grease will decrease the volume of the meringue. Add the sugar very gradually at first, beating well after each addition, until the meringue is smooth and glossy. Spoon a bit less than a third of the meringue out onto each tray, using the template to spread it into a flattish circle. If you have leftover meringue, you can pipe little meringue sticks or puffs onto another tray to bake – I won’t stop you. Depending on your oven, you may have to bake the meringues in batches – I did manage to get all three into the oven on Monday night, but the top one came out really weirdly, so this might have been a bad idea. They will need a bit over an hour in the oven, and maybe a little longer with the door half open to finish drying out. And now you see why I like to make them in advance, because this is where your night gets really, really late. I use the microwave method for this (more details at the link). In a glass or other microwave-friendly bowl, beat the egg yolks, and stir in the lemon zest and juice, sugar, and finally the butter. This is dead easy. Put everything in a small saucepan and stir over the lowest possible heat until the sugar is completely dissolved. Remove from heat and let cool. Gather your cooled cakes, meringues and lemon syrup, and cold lemon curd. Whip the cream with the vanilla essence until it forms stiff peaks. Wash and dry your berries and flowers (making sure you haven’t added any free-range ants to this recipe), and hull and halve your strawberries. Spread the cream over the cake (you won’t use all of it, but you can put it in a dish to serve with the cake), scatter your berries over the cake, and dust with icing sugar. Lay a few flowers and petals over this, and dust even more lightly with icing sugar. This cake is never going to be vegan or egg-free, and I think we all need to accept that and move on. You could make it dairy free, I think – I’d use half and half coconut butter and margarine in the sponge, and for the curd, I’d use the recipe for coconut and lemon cream from Ariana Bundy’s Sweet Alternative, though you would need to double it or maybe triple it to get enough. 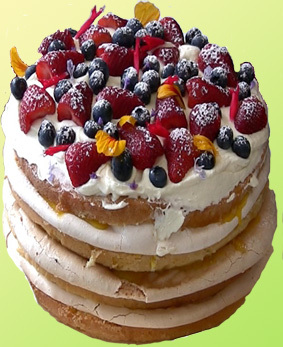 Gluten-free would be more difficult; I think you’d want to go to an expert to find a good gluten-free Genoise sponge recipe (there’s one of these in Bundy’s book, too, but I haven’t tried making it, so I can’t tell you how good it is). In terms of flavour, why meddle with perfection? But I think it would work rather well with grapefruit, especially pink grapefruit (though do check the tartness in your curd – my lemon curd is very tart, and grapefruit might take it too far), and possibly with blood orange, though this might be a little too sweet. Of course, if I went the orange route, I might feel compelled to add a little cocoa to the sponge and/or meringue, and maybe head for utter decadence with a chocolate cream cheese icing and raspberries and candied orange slices on top, and actually, I feel a diabetic coma coming on just contemplating that, so it might be a bit much. Perhaps you should stick to the lemon for now. This recipe is complicated enough without fiddling with it. Wow this looks very nice and very complicated. I’m afraid I don’t really have the patience to cook a 6 hour cake, but it does look like it would be worth it. It is all of those things, yes. It’s one of those things that is an absolute pain in the neck, but I love it so much that once or twice a year I have to make it anyway. Also, it’s really, really cheap (because the value is all in the labour), so it’s good when someone has a big birthday but you’re broke. My mistake was making it for a work bake-off yesterday, because now all my lab-children want me to make it for them…! Incidentally, I love the look of your blog! Definitely my sort of food. Thanks very much! I guess if you’re only making it now and again it’s fine. Must be a good thing to fill a rather boring day! Perhaps I shall eventually give a cake this complicated a try! WOW! You have so much patience… perhaps one day someone in my family will get this for their birthday cake…. one day! It’s very much a special occasion cake, yes!